Adobe today reported quarterly earnings for its third financial quarter of the year. While the company reported another decline in revenue and earnings per share to $995.1 million and $0.32 respectively — something most analysts expected — the company also announced another quarter of impressive growth for its Creative Cloud subscription service. 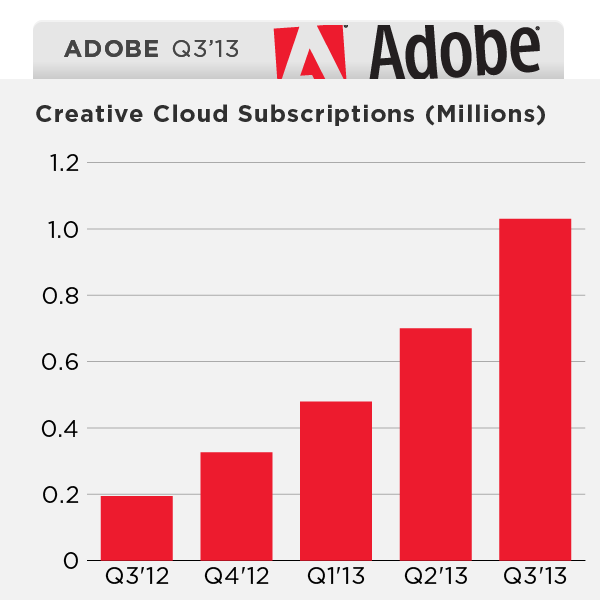 More importantly, though, Adobe also today reported that Creative Cloud now has passed 1 million subscribers. Earlier this year, Adobe said that it expected to have 1.25 million paid subscribers (both individuals and teams) by the end of the year, a number that now seems to be within easy reach. “We exceeded one million subscriptions during Q3, demonstrating that the transition to Creative Cloud is happening sooner than expected,” said Shantanu Narayen, Adobe’s president and CEO in a statement today. Adobe is betting big on Creative Cloud and it’s now the main way for its users to get access to its software. While most users and pundits expected Adobe to make this move over the coming years, the announcement that it would stop selling shrink-wrapped software came as quite a surprise to many when Adobe announced it at its MAX conference earlier this year. Adobe, however, has always argued that Creative Cloud’s momentum was so good, it decided to take the risk and change its business model sooner than anticipated. With this change in business model for its most important product, Adobe is obviously giving up short-term revenue for long-term subscription income. This will bring down the company’s quarterly earnings for the time being — something that’s clearly reflected in today’s report — but it’s not a surprise for investors who have generally been supportive of the company’s move. Indeed, Adobe’s stock hit record highs earlier this week ahead of today’s earnings report and it’s up sharply in after-hours trading.